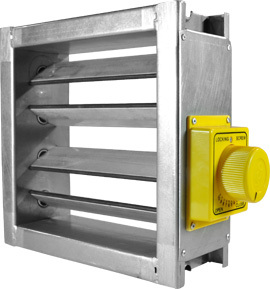 The model ATVCD-SQ series control dampers or balancing dampers (CS/BS) are manufactured as per DW144/SMACNA standards. 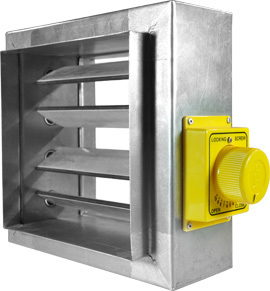 This series of dampers are used in HVAC ducting system to regulate air flow and pressure. 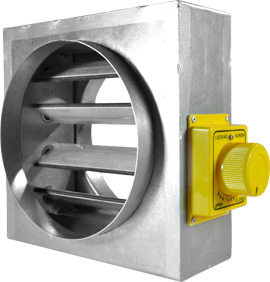 Multiple regulating aerofoil blades are mounted in GI housing and are controlled through gears from one point. A unique control handle made out of high impact strength plastic with position indicator and locking screw is provided as standard option. 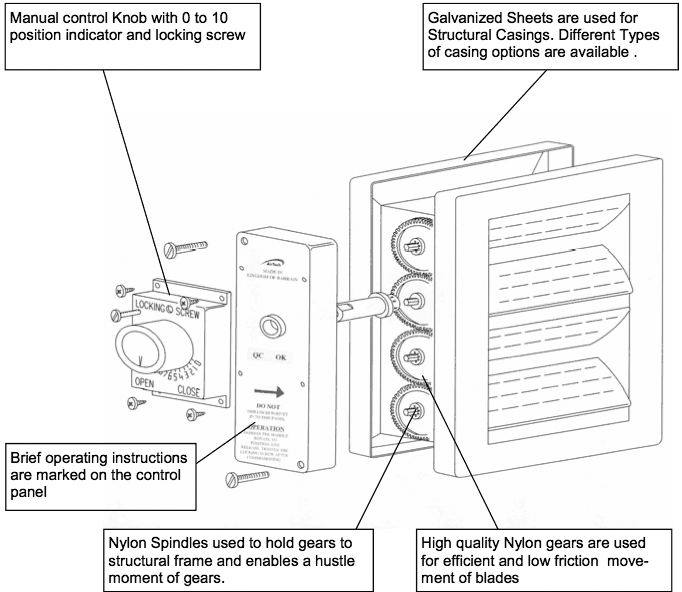 All drive gears and spindles are of nylon to deliver years of fool-proof operation. All dampers are manufactured and inspected before dispatch as per the companies quality assurance and quality control procedures. Flange options Two type of Flange options 25mm/35mm are available. 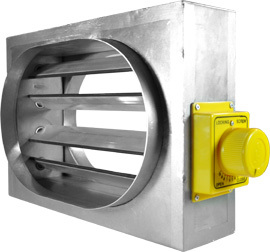 Flange options Add on Flange options of 25mm/35mm are available on re- quest. CS Type — These extruded aluminum aerofoil blades are generally used in CS series con- trol dampers. The high quality bulb seals inserts on the aerofoil blades gives excellent volume control performance by virtually eliminating the possibilities of air leakage through blade gaps. BS Type — These extruded aluminum aerofoil blades are generally used in BS series balancing dampers. All other characteristics for BS type are the same except the bulb seals. Actual Spigot dimensions will be 3mm less than the listed size. Up to 1000mm width and height will be supplied as single unit and above 1000 in multiple units with one casing. For multiple units one actuator will be provided for each unit. Aerofoil blades Made of Extruded Aluminum Profiles with a wall thickness of 1.20mm either plain or bulb sealed. Control Knob Injection moulded high impact resistant plastic. Bulb Seals Extruded Synthetic Seal with 1.00mm wall thickness (applicable for CS type only) Paints Zinc rich aluminum paint for weld joints.